We observed the methane flux of 12 experimental plots near Toolik Lake, Alaska. Plot location was chosen based on dominate vegetation type (T or W). The tussock tundra plots are located near the Moist Acidic Tundra plots characterized by Shaver ad Chapin (1991). The wet sedge plots are located near the outlet of Toolik Lake; all plots have been used by the Arctic LTER project at Toolik Lake. We used the static chamber method for each sampling event, covering the plot with a plexiglass fluxing chamber and a shade cloth to maintain a cool temperature. At twenty minute intervals for a total of 60 minutes, we obtained 10-20 mL of chamber air in nylong, airtight syringes. 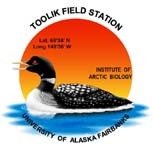 The syringes were returned to the laboratory at the Toolik Field Station and were ran on a Shimadzu model 14A gas chromatograph with a flame ionization detector (FID). The chromatograph peak areas were converted to concentration based on a standard curve. Methane fluxes were calculated using a linear regression of the syringe concentrations that characterized the change in methane concentration in the flux chamber over time.